Gasway have commissioned me to convert their giant rubber duck for the Grand Norwich Duck Race into a comedy creature of punny proportions. 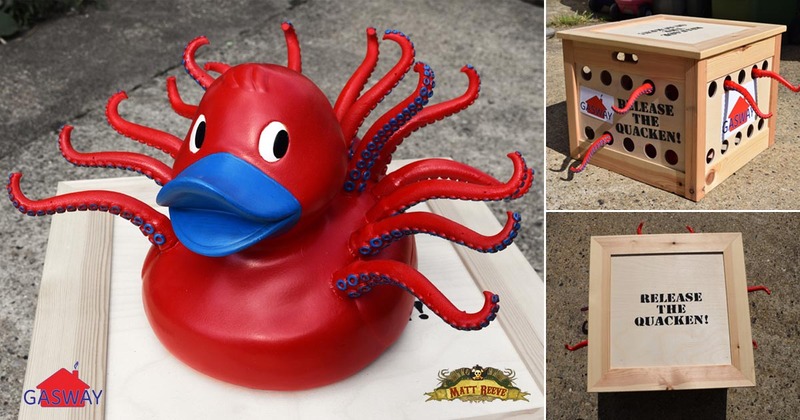 The Quacken, (a wordplay on ‘Kraken’, a mythical tentacled beast believed by Vikings and sailors to drag ships to their doom) needed to retain it’s essential ‘rubber-duckiness’ whilst still living up to it’s name. What better way than to cover it in wobbling tentacles and a bright new coat of rubberised Plasti-dip paint in Gasways bright primary colours! To accompany it and protect its delicate appendages I created a branded and stencilled travel crate with air holes and additional prop tentacles peeking through the front and sides. Footage from the BBC of the Grand Norwich Duck Race that took place on Sunday in support of Break. Well done to all those involved and those who braved the weather. Spot the Quacken at 0:08 and underwater at 0:42!